for the dedicated home barista. Why Should I Use Extraction? Use it to continually track your performance. Or use it temporarily when dialing in a new grind setting or making other changes to the setup. Time your shots. 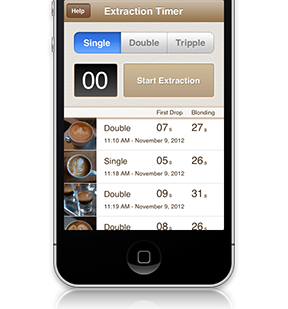 Extraction keeps them logged for you in chronological order. Take a photo of the results with your iPhone camera. Make notes regarding taste, technique or anything else. The timer marks pre-brewing time. This is a good time to track on many semi-pro machines using the E61 or other pre-brewing capable group head*. * the effectiveness of pre-brewing on these kinds of machines is highly debated. Even if you don’t “believe” in pre-brewing this time is useful since it provides you with a time for how long the water needs to penetrate the grind. © 2010 Martin Westin. All rights reserved.